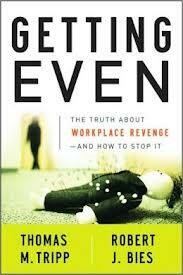 Revenge in the Workplace Research Papers look at workplace violence, and the reasons why it occurs. The last words three of Paul Calden’s former colleagues ever heard were – “This is what you get for firing me.” Nine months after being fired, Calden returned to the insurance company at which he was employed and opened fire on workers present in the firm’s cafeteria, killing three people. Unfortunately, cases such as this are not unique – between May 1988 and May 1994 the media reported on 89 different incidents of workplace homicide performed by “nonstrangers” – either current or former employees. Most such homicides were undertaken as revenge for grievances or disciplinary action at work . Fortunately, most of the approximately two million cases of workplace violence reported each year are far less fatal. But workplace violence is a common method employed by workers seeking revenge for real or perceived injustices occurring in the workplace, who often resort to sabotage to get back at unfair employers. The very word ‘sabotage’ comes from the French sabots which means clogs or wooden shoes – disgruntled French weavers used to throw their sabots into the looms to clog the machines and enjoy some “time-off”. Equity theory predicts that employees who perceive that they are treated unequally in comparison to others will seek to restore distributional justice . One method employees have found to be effective in restoring justice is revenge – although it may not alter the physical situation the employee is exposed to, for example, a verbally aggressive superior, the emotional satisfaction received acts to reduce the tension that has built within the employee’s mind and to restore emotional equity. This paper explores the concept of justice within the framework of the workplace, reviews the concept of revenge while providing numerous examples of the methods of revenge employed by disgruntled employees, proposes a hypothesis of revenge as a response to injustice in the workplace and outlines a possible study and methodology to analyze said hypothesis. Justice is a frequently used and often controversial concept in the study of organizations. Four common models of justice exist in the literature – distributive justice, procedural justice, interactional justice and restorative justice . Distributive justice is characterized by the equity theory as proposed by Adams in his seminal 1965 paper. Adams attempted to explain how employees react in scenarios in which they are treated more or less equally in relation to other reference colleagues. Distributive justice revolves around individuals’ desire to experience comparative equity in resources and outcomes, and inequitable comparisons cause anxiety and motivate the individual to restore equity in order to relieve the tension. Such justice, therefore, advocates equity in the distribution of outcomes. Paper Masters writes custom research papers on Revenge in the Workplace and look at workplace violence, and the reasons why it occurs.